Already a number of individuals in the USA who have been inspired by Archbishop Denis Hurley who want to support our work. Since we are not directly registered in the USA, in order to collect funds and to give our donors the appropriate tax advantages we are working with an organisation that helps facilitate US donations. Please be aware that they will deduct 10% for managing the donation (and 12%-13% in the case of credit card donations). This is unfortunate but it is the only way that we can collect US donations in a way that is tax efficient for the donor. Supporters may choose to contribute to the Denis Hurley Centre Fund, a donor advised fund of Silicon Valley Community Foundation. 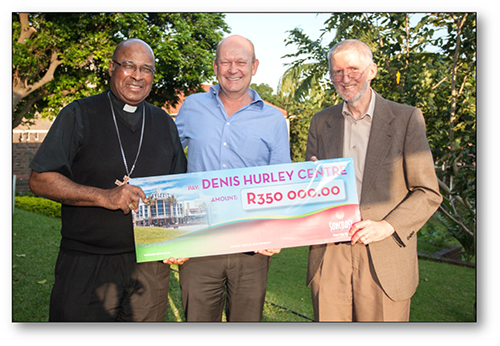 Funds are being raised on behalf of the community foundation for the benefit of the Denis Hurley Centre Fund. To make a donation, please make your check payable to Silicon Valley Community Foundation and include "The Denis Hurley Centre Trust” in the memo line. Contributions may be mailed to Silicon Valley Community Foundation, 2440 West El Camino Real, Suite 300 in Mountain View, California 94040. Gifts of stocks, bonds and other appreciated assets are also accepted, and for more information donors can contact the community foundation directly at 650.450.5444 or donate@siliconvalleycf.org. To donate via credit card, please use the PayPal link below. The community foundation is a nonprofit 501(c)(3) organization and will acknowledge all gifts, which are tax-deductible to the fullest extent of the law.